Long blonde curly hair is super popular for women. It’s a classic style and so we have a huge and growing photo collection showcasing this style, length, color and hair type. Whether you have naturally curly hair or curl it from time-to-time, you’ll find some examples that you’ll love here. Scroll through our huge collection below and/or filter down your search with our really great site search features and menus. Be sure to come back because we had dozens of new styles weekly. You’ll notice that while this is quite a specific type of styling, there are many differences and it looks different on different women – we have examples for all ages. While Emilia Clark may not sport long blonde curly hair in real life, her iconic character of Khaleesi in the forever-popular series, Games of Thrones, has made everyone fall in love with this look. One thing is for sure— long blonde curly hair can never go out of style. However, it can be a little hard to maintain and style such hair. In fact, if you have long and blonde curly hair, you are probably already familiar with the ordeal of picking the right hairstyle for your hair. 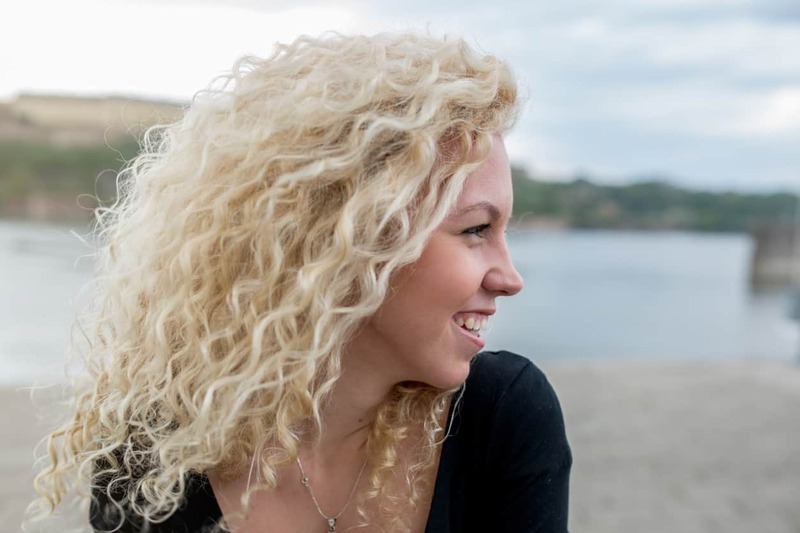 No frets – Scroll down and take a look at some of the most trending and equally beautiful hairstyles for long and blonde curly hair. It is impossible to talk about blonde curls and not think of Taylor Swift. For a long time, she sported this hairstyle that features long blonde curly hair with side bangs. Curls are a style on their own, so if you have long curly hair, just let it down and let those curls go crazy all over the place. The bangs make sure that your hair perfectly frames your face, bringing focus to your facial features. When it comes to curly hair, texture plays an important part. For example, while this hairstyle is fairly simple, it is all about the texture. The hairstyle features long curly blonde hair tied in a tight, high ponytail. While this hairstyle is easy to create and perfect for everyday styling, keep in mind that it may be difficult to achieve this look with silky hair. Natural curls are great but to achieve this look you may still have to bring in the styling tools and products. Note how tight and beautiful these curls are! This hairstyle will look gorgeous on everyone but if you have long blonde hair, you are simply going to take it to the next level! The beauty of this hairstyle lies in its simplicity. If your hair has got the right curly texture, all you need to do is let them down and bring all strands to the front in order to recreate this beautiful look. 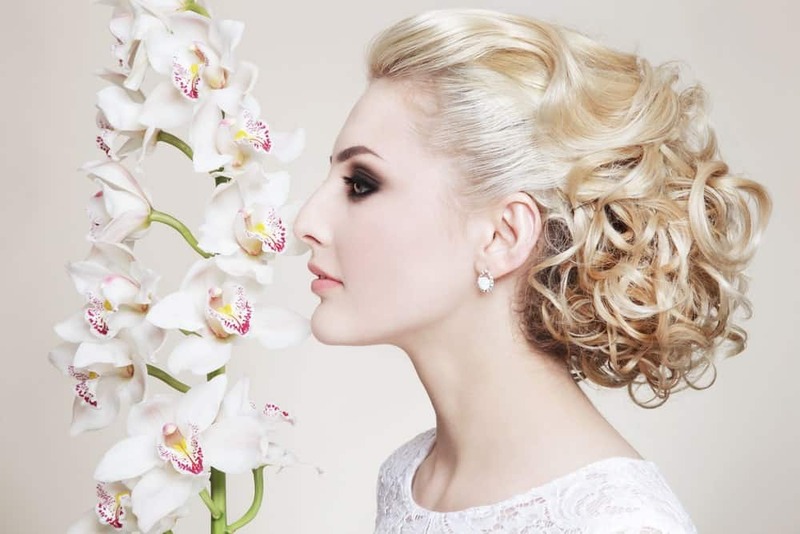 Nothing says elegance like this hairstyle for long and blonde curly hair. It features hair cut in layers and gathered at the back of the head where the top layer forms a loose half-braid. The rest of the hair simply flows down the shoulders and over the back. In the front, side bangs perfectly frame the face to bring out the eyes. This hairstyle gives you a lot of options for decorating your hair. Whether you put in flowers of some fancy clips, you are bound to look stunning. The cherry on top – you won’t have to worry about loose strands going into your eyes when you rock this hairstyle. While long curly blonde hair can look perfect without any styling at all, it is always fun to go a little extra with it! 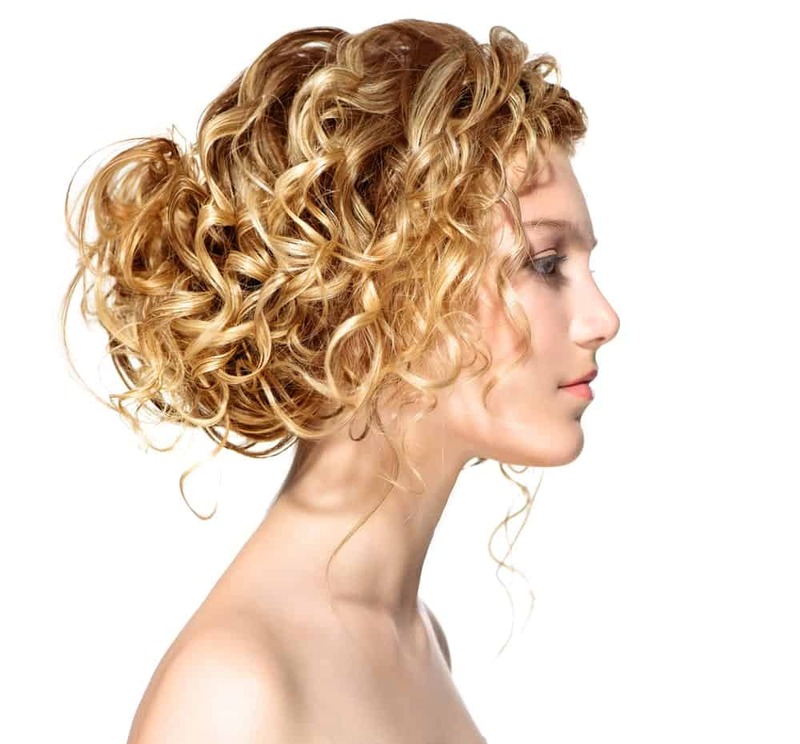 Check out this low hanging bun hairstyle, which is perfect for long blonde curly hair. Sure, it is going to take you some time to recreate this hairstyle but the final look is totally worth it. This hairstyle is also a good option when you are in the mood to glam up and show off your earrings! However, if you plan to recreate his look, better start getting ready earlier than usual! This hairstyle is perfect for you if you love to let your curls hand lose without having to worry about wiping them out of your face and eyes every two seconds! The hairstyle features gorgeous long blondes curly hair and micro braids. Note those tiny, hardly-visible micro braids that are tucked in to one side of the head, creating a mesmerizing look and giving the hair all the texture it needs to not look bland or flat. The rest of the hair loosely flows down the shoulder and gathers around in soft blonde curls. This curly blonde hair look is perfect for a night out! Want to feel a little fancy? Go for the ultimate princess look with this hairstyle! It features long blonde hair. This hairstyle works best when your hair has a loose curly texture. It gathers your hair at the back in a loose bun. However, as you can see, it is no ordinary bun! The strands of your blonde hair need to go around in loops to create this beautiful look. In the end, slay the look by adding a tiara. With this hairstyle, you can be the queen that you are! Do keep in mind that while this hairstyle offers a classic bridal look, it is equally good for prom night, date nights, or any other formal event! While this hairstyle for long blonde hair is relatively simple and easy to create, it offers nothing less than a true film-star look. The hairstyle is simple – it features long blonde curly locks of hair, loosely hanging down the shoulders. However, the distinctive thing about this hairstyle that makes it stand out f the crowd is its volume. Notice how voluminous the hair looks? If you have light hair, this hairstyle may be your best option to add a little fluff and volume to your hair. Moreover, perhaps, the best part about this hairstyle is that all you need is a little blow dry and hairspray and you are good to go! Nothing can beat this hairstyle in cuteness because it’s just so adorable. Plus, it is perfect for all occasions – from weddings to a beach day, this hairstyle offers just the right look. It features long curly blonde hair that is set in a loose and messy, stylish braid at the back of the head. Below the braid, the curls hang down the shoulder, reaching to the back. This hairstyle offers the perfect opportunity to showcase your majestic curls without overdoing it. In the front, it perfectly frames your face while making sure yours stay out of your face. Keep in mind that contrary to how it looks, the hairstyle is relatively easy to create and with a little practice, you can master it in no time! This hairstyle is the perfect messy look that will leave you looking chic and trendy. The hairstyle features a low hanging messy bun at the back of the head coupled with loose strands of hair falling around the face. It is the ideal hairstyle for all the busy bees out there who cannot spare more than a few minutes for styling up their gorgeous long and blonde curly hair. To recreate this look make sure that your bun is loosely tied, putting the power of your curls to full use. 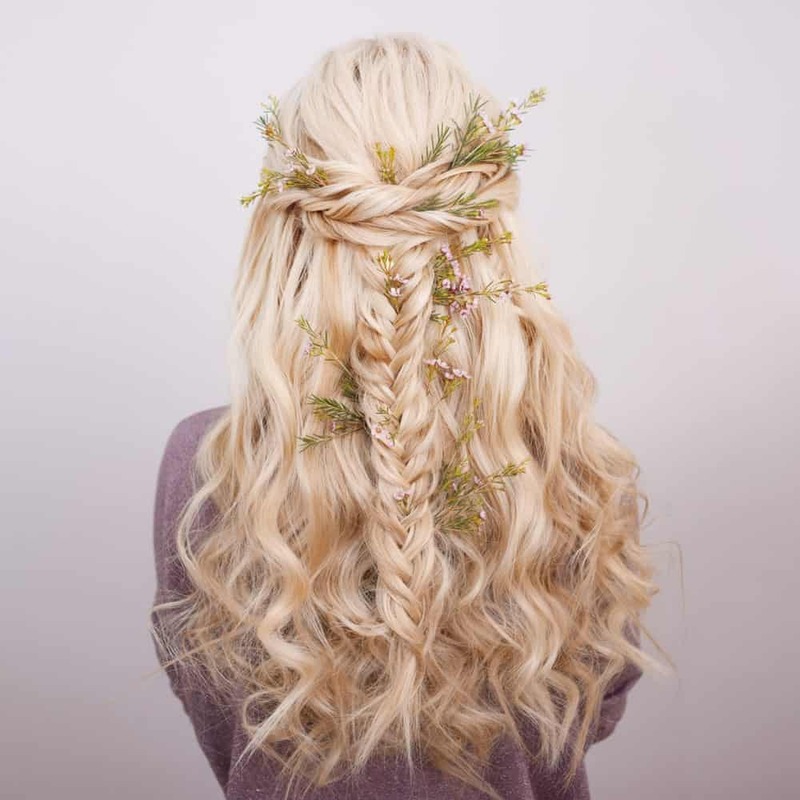 Bring out your inner “Khaleesi” with this ultra-awesome hairstyle for long curly blonde hair. If you are a fan of braids, you will love this hairstyle that features two styles of hair braids, one forming a crown at the back of the head while the other, which is a fishtail, adding texture to the hair and giving it a gorgeous look. To finish off the look, add a floral touch by decorating your hair with flowers. Whether you use fresh flowers or opt for the artificial ones that are specially designed for hair – it is a great way to take your hairstyle to the next level and add an X-factor to it! It is impossible to go wrong with this look. This hairstyle is all about turns and loops. If you think it looks quite complex to recreate, you are far from reality because, with just a little practice, it is possible to become a pro at creating this hairstyle in a short amount of time. If you look closely, this hairstyle features loosely tied braids, braided into one! 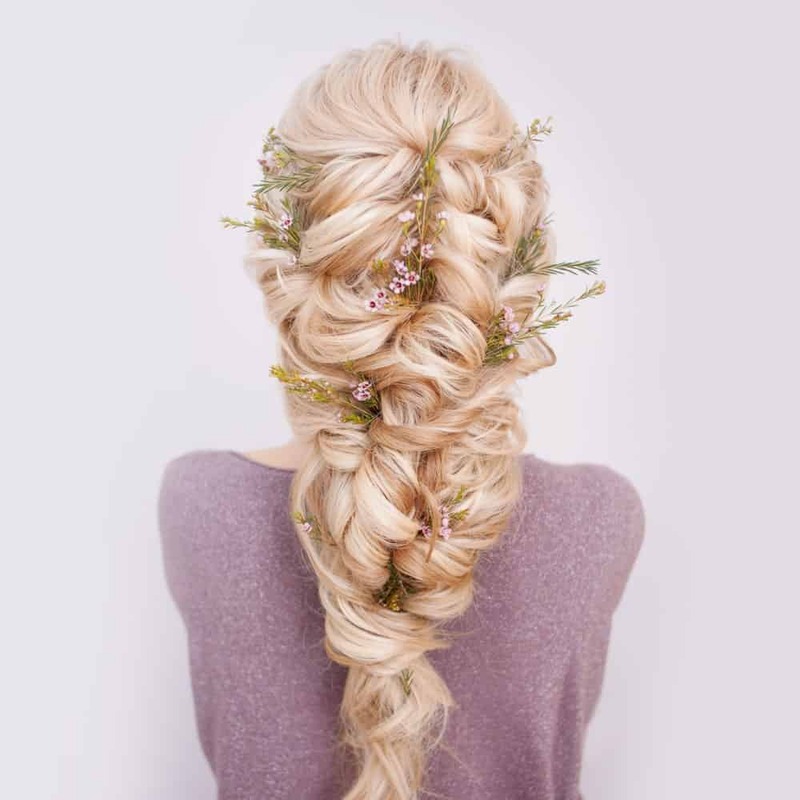 To finish off the look, decorate your hair with strands of fresh flowers. 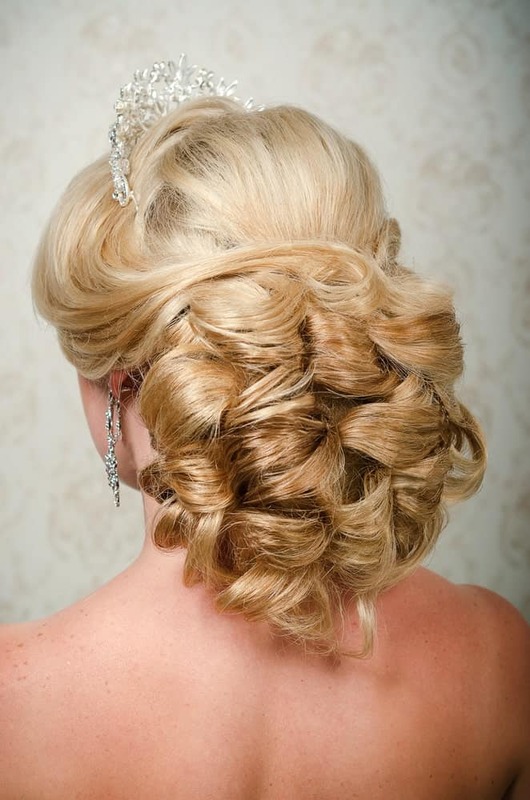 Just like most other looks involving long blonde and curly hair, this hairstyle is perfect for all occasions. 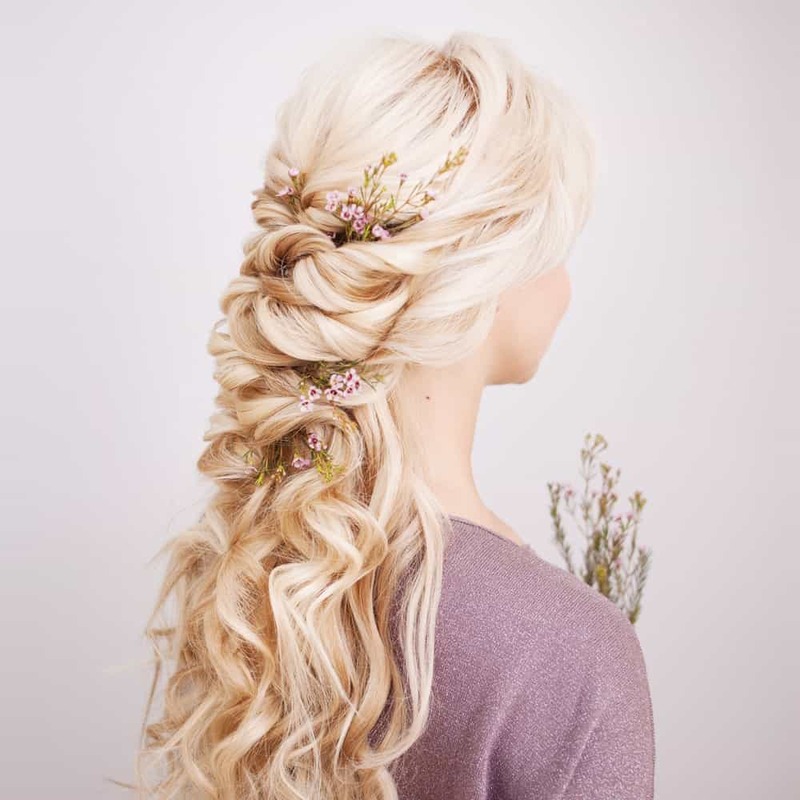 Whether you are getting ready for a wedding for going to a concert, this braided hairstyle for blonde long hair with loose curls will only add to your beauty. This one is all about braids. Curly hair is never short of texture but introducing a few braids in the hairstyle can take it to the next level. Check out this hairstyle for blond and long curly hair that features three braids among loose hair at the back of the head. 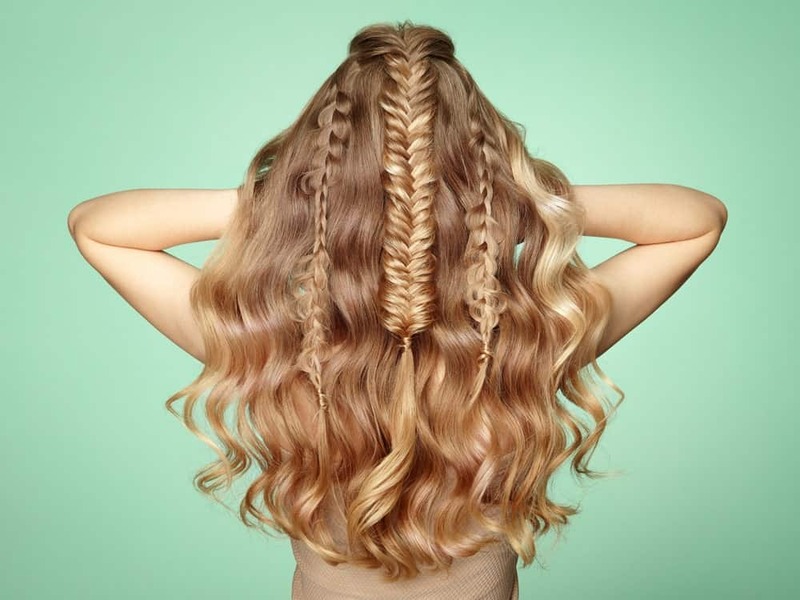 One thick fish braid at the center with a small braid at each side is all you need to recreate this absolutely stunning look. So, which hairstyles for long and blonde curly hair do you like the most? The best part about having such hair is that it is impossible to go wrong with it. Whether you let it loose or spend an hour creating an elaborate hairstyle, the end result is always stunning!